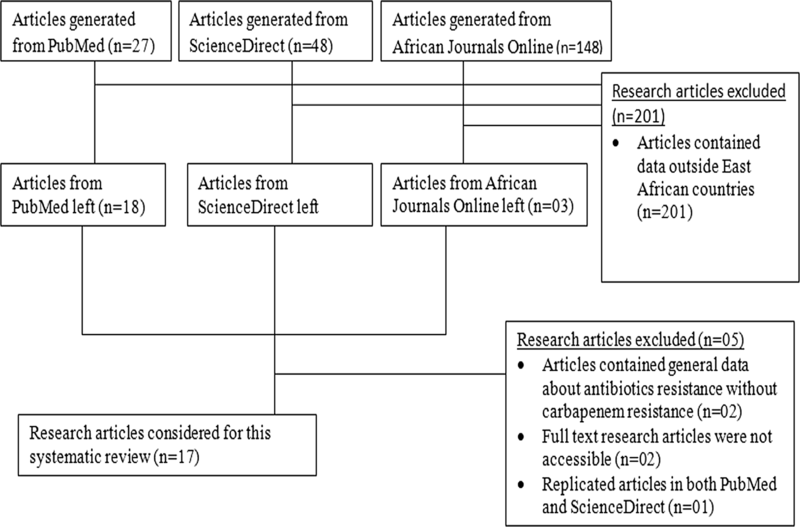 In this systematic review, we present the molecular epidemiology and knowledge gaps of the carbapenem resistance in East Africa as well as the future probable research interventions that can be used to address the emergence of carbapenem resistance in the region. The 17 articles which presented concrete information about the prevalence of carbapenem resistance in East Africa were reviewed. Tanzania exhibited the highest level of carbapenem resistance at 35% while DRC had the lowest level at 0.96%. Uganda was the only country with studies documenting CR obtained amongst hospital environment isolates with incidence ranging from 21% in Pseudomonas aeruginosa to 55% in Acinetobacter baumannii. Carbapenem resistance was more exhibited in A. baumannii (23%), followed by P. aeruginosa (17%), Klebsiella pneumoniae (15%), Proteus mirabilis (14%) and Escherichia coli (12%) mainly isolated from respiratory tract, blood, urine and wound/pus. The regional genetic determinants of carbapenem resistance detected were blaIMP, blaVIM-1 blaSPM-l, blaNDM-1, blaOXA-23 blaOXA-24, blaOXA-58 and blaKPC. In the recent past, carbapenems were potent against all multiple drug resistant (MDR) Gram negative bacteria and in combination with their negligible toxicity to the host, carbapenems became the preferred last resort antibiotics for the treatment of MDR Gram negative bacterial infections. Development of carbapenem resistance (CR) in Enterobacteriaceae is of great concern because there is no obvious next line of antibiotics to use against carbapenemase producing (CP) Enterobacteriaceae . MDR has left less efficient antibiotics to take care of these expensive hard to treat life threatening infections [2–6]. Currently, the high prevalence of carbapenem resistant Enterobacteriaceae (CRE) isolates world over most importantly in Klebsiella pneumoniae and Escherichia coli isolates in hospitals, community-associated infections and animals is a huge burden to the health care system [3, 5–12], Additional file 2: Table S6. Genetic determinants of CR have been classified into: Ambler class A beta lactamases which include; KPC, GES/IBC, SME, NMC-A, IMI and SFC [12–15], Ambler class B beta lactamases which are termed as Metallo beta Lactamases consisting of NDM, VIM, IMP, SPM, GIM, SIM, KHM, AIM, DIM, SMB, TMB and FIM [7, 13]. IMP, VIM and NDM plasmid mediated Metallo beta lactamases are of worldwide occurrence possibly because the genes that code for them are located on mobile genetic elements  and carbapenem hydrolyzing class D beta lactamases (CHDLs) encompass various group of oxacillinases (OXA) with hydrolytic activity of amino and carboxy penicillins , Additional file 2: Tables S3–S5. Studies have reported the existence of CP bacteria in East Africa but in general, there is no comprehensive data about the molecular epidemiology of CP organisms and its burden on the health care system [17, 18]. Furthermore, there is scanty information about CR prevalence in East African livestock yet MDR genes were observed in livestock commensal bacteria which are probably transmitted to humans through the food chain [19–21]. Comprehending the current status of CR throughout East Africa will influence decision making among stakeholders about the rational use of carbapenems. Therefore, this systematic review expounds the current molecular epidemiology of CP bacteria in East Africa, highlighting the carbapenemases genes, CR Knowledge gap and future research interventions to address CR in East Africa. PubMed, ScienceDirect and African Journals Online databases were searched from March to December 2017. The search key words used were carbapenem resistance in East Africa to extract articles published only in English from 2008 onwards in an attempt to include up to date relevant CR data, Fig. 1. Only full text research articles reporting the prevalence of CP bacteria isolated from patients and hospital environment in East African countries namely; Kenya, Uganda, Tanzania, Burundi, Rwanda, Ethiopia, Democratic Republic of Congo (DRC) and South Sudan were used. Only Studies elaborating bacteria study population, pathogens identified, phenotypic and genotypic methods used to detect CR were used. Patients’ populations of all ages were included while case reports and review articles were excluded from this systematic review as it has become conventional . A database was created in which study location, publication year, sample collection period, bacterial species isolated, number of isolates tested for CR, CR prevalence, carbapenemase genes, methods used to identify resistant isolates and to type CR genetic determinants were included, Table 1. Data analysis was performed using one-way ANOVA in XLSTAT version 2018.1 to establish the most prevalent carbapenem resistant bacteria type and their distribution variability within body systems. A P value of ≤ 0.05 indicated significant statistical difference. The search conducted between January and December 2017 generated 223 research articles; PubMed, Sciencedirect and African Journals Online liberated 27, 48 and 148 respectively. Using article abstracts and titles, 201 articles were excluded from this systematic review. Only 20 full text articles were accessible out of the 22 papers. Of the remaining 20 manuscripts, 17 presented concrete information about molecular epidemiology of CR in East Africa and consequently included in this review, Fig. 1. The search generated four manuscripts from Uganda, seven from Kenya, two from Ethiopia, and Tanzania, one from DRC and Rwanda, Table 1. Neither articles from Burundi nor from South Sudan met inclusion criteria for this systematic review. All studies were epidemiological hospital based cross sectional in nature and majority illustrated the prevalence and genetic determinants of CR as well as the methods employed to detect CP isolates, Table 1. According to the molecular and antibiotics susceptibility assays employed in the articles incorporated into this systematic review, Tanzania exhibited the highest level of CR among enteric clinical isolates at 35% while DRC had the lowest level at 0.96% [35, 38], Table 1. Uganda was the only regional country with two studies documenting CR obtained amongst hospital environment isolates [32, 33]. These studies reported hospital environment CR prevalence ranging from 21% in P. aeruginosa to 55% in A. baumannii, Table 1. Only 12 articles analyzed in this review had detailed information about the samples from which CP bacteria were isolated, Table 2. The mean sample wise CP bacteria distribution was highest in respiratory tract samples (23%), followed by blood (22%), urine (19%), wound/pus (18%), stool and peritoneol fluid (10%), other samples (7%), ear swabs (6%) and cerebral fluid (3%), Additional file 1: Table S1. Seven studies reported CR in urine and blood isolates with prevalence ranging from 0.96% (DCR) to 39.2% (Tanzania) and 7% (Kenya) to 36.36% (Tanzania) respectively. Six articles documented respiratory tract CP bacteria with occurrence varying from 3.45% (Uganda) to 55.6% (Kenya) while five articles displayed CR in pus/wound isolates with a resistance incidence ranging from 7.14% (Uganda) to 33.04% (Tanzania), Table 2. Pus (112), urine (56), blood (55), aspirate (3), and sputum (1). One-way ANOVA displayed that distribution of CR among different bacteria species was not significantly different (P-value = 0.11 > 0.05). CR prevalence was highest in A. baumannii with an average of 23% followed by P. aeruginosa (17%), K. pneumonia (15%), P. mirabili (14%), E. coli (12%), C. freundii (8%), K. oxytoca (2%), M. morganii (2%), Salmonella spp E. sakazaki and Stenotrophomonas spp (1%). However, the most reported CP isolate across the region was K. pneumoniae (8 studies) followed by E. coli and P. aeruginosa (6 studies), A. baumannii (4 articles), M. morganii and Salmonella spp (2 articles), C. freundii, K. oxytoca and P. mirabilis (2 articles), E. sakazaki and Stenotrophomonas spp (1 article), Additional file 1: Table S2. CR genetic determinants in non-glucose fermenting bacteria reported at Mulago hospital were blaIMP-like (36%), blaVIM-like (32%), blaSPM-like (16%), blaNDM-1-like (4%) for P. aeruginosa and blaOXA-23-like (60%), blaOXA-24-like (7%), blaOXA-58-like (13%), and blaVIM-like (13%) for A. baumannii . Carbapenemase genes in CRE at Mulago and Mbarara hospitals were also documented [30, 31]. At Mulago, the genes characterized included; blaVIM (10.7%), followed by blaOXA-48 (9.7%), blaIMP (6.1%), blaKPC (5.1%) and blaNDM-1 (2.6%). The highest number of genes appeared in Klebsiella pneumoniae (52.2%), followed by E. coli (28.4%), Enterobacter spp (7.5%), Serratia marcescens (4.5%), Proteus mirabilis (3.0%), Citrobacter freundii, Klebsiella oxytoca, and Pantoea agglomerans at 1.5% each while at Mbarara hospital, VIM and OXA-48 CR determinants were registered, Table 1. Molecular analysis of CRE at a tertiary hospital in Mwanza established by multiplex PCR revealed that the principal CR genes were IMP (21.6%), followed by VIM (12.3%), OXA-48 (4.9%), then KPC (3.5%), and NDM (3.1%). CP E. coli had the highest prevalence (14%), followed by K. pneumoniae (10.57%), trailed by P. aeruginosa (10.13%), then Klebsiella oxytoca (1.76%), A. baumannii (1.3%), C. freundii (0.88%), Serratia marcescens (0.88%) and Salmonella spp. (0.44%)  while CP P. aeruginosa harbouring VIM CR gene were identified from Muhimbili National Hospital, using PCR , Table 1. CP K. pneumoniae, A. baumannii and Pseudomonas aeruginosa possessing NDM and VIM-2 genes respectively were isolated in Nairobi [21, 24, 25] while Whole Genome sequencing (WGS) was employed to identify NDM-1like CR genes in K. pneumoniae isolates at Kilifi County Hospital , Table 1. The most prevalent CRE across the region were K. pneumoniae and E. coli. CR in K. pneumoniae was reported by eight articles with mean prevalence of 15% in all East African countries except Rwanda and DRC while CP E. coli was accounted for in all countries apart from DCR by six studies with an average occurrence of 12%. This is in agreement with global data about CR. For example in USA, 11% of K. pneumoniae infections and 2% of E. coli infections were resistant to carbapenems  while in India, 13% of E. coli infections and 57% of K. pneumonia infections were caused by CP strains . Additionally, high frequency of CR among the non-glucose fermenting P. aeruginosa (17%) and A. baumannii (23%) almost equal to that of CRE was registered in the region (Table 1 and Additional file 1: Table S2). This is in conformity with worldwide reports acknowledging that the magnitude of CP A. baumannii and P. aeruginosa is equal to that of CRE . The highest frequency of CR in the region was 35%. This prevalence correlates with other studies in India [43, 44] where the prevalence was 43% and 30% respectively. Contrary, this frequency is higher than CR levels reported by other studies in Nigeria (15.2%) and USA (4.5%) but lower than that of 68% reported by a broad study executed in 7 out of the 9 provinces of South Africa [45–47]. The actual occurrence of environmental contamination by CP bacteria is not well researched yet hospital environments tainted with CP bacteria by infected patients are implicated as the main routes of transmission [48, 49]. Across East Africa, only two studies conducted in Uganda reported the existence of CP P. aeruginosa and A. baumannii isolated from hospital environment. The frequency varied from 21% in P. aeruginosa to 55% in A. baumannii, Table 1. Related studies which recovered CP bacteria from hospital environments in Israel and Brazil reported closely related results [50–52]. Horizontal transfer of mobile genetic elements from clinical pathogens to environmental bacteria can occur within the hospital environment hence promoting emergence of new resistant bacteria strains. Furthermore, resistant bacteria in hospital environment such as sewage may spill into the food chain, hence becoming one of the sources of community-acquired resistant pathogens . This systematic review revealed that CP bacteria are highly distributed in the respiratory tract (23%), Blood (22%), urinary tract (19%) and wounds/pus (18%) in East Africa and this is in line with other investigations conducted in India [44, 53] and USA , where they reported high incidences of CR respiratory tract, urinary tract, blood and wound bacterial infections. Various studies around the global have characterized the different variants of each genetic determinant of CR, Additional file 2: Tables S3–S5. Unfortunately, all these variants and their epidemiology are yet to be documented in East Africa, S-CRKGEA. Emergence of CR in K. pneumonia strains harbouring Extended Spectrum Beta-Lactamases-ESBLS (CTX-Ms or SHV-2) or plasmid borne AmpC enzymes (ACT-1, CMY-2, CMY-4 or DHA-1) in association to loss of outer membrane proteins (OMPs) as a result of truncated OMP gene [54, 55] is yet to be acknowledged in East Africa. Occurrence of CP bacteria in livestock and their environment was reported in Europe [9–12] while in East Africa no such research has ever been conducted. Identification of CP bacterial infections at their first appearance provides an opportunity to interfere before these CP organisms are spread more extensively . Therefore, utilizing a robust molecular platform, the WGS, all genetic determinants of CR in humans, livestock and environment should be identified and documented hence bridging the knowledge gap about the molecular epidemiology of CP bacteria in East Africa. Antibiotics resistance stewardship team may profit from data generated by molecular testing of MDR organisms to enhance prevention of intra and inter health facility transmission and the possible cyclic transmission between livestock, humans and environment. Results of the 17 articles that illustrated significant CR across East Africa have been summarized by this review. However, in South Sudan and Burundi no studies have ever been conducted to investigate the epidemiology of CR. Furthermore, studies carried out in Rwanda, DRC, and Ethiopia were aimed at addressing general antimicrobial resistance hence providing very limited CR data while in Kenya, Uganda and Tanzania, more elaborate specific CR in enteric bacteria studies have be performed. Therefore this has led to a significant variation in knowledge about CR in the region. This work was carried out in collaboration between all authors. DKB and FB conceptualized this project and designed the format for this systematic review. KS and EW performed the literature search and data analysis. KS, DKB, EW and FB drafted the section of literature review. KS wrote the first draft of the manuscript and managed manuscript revisions. DKB, FB and EW participated in manuscript writing and revisions. All authors read and approved the final manuscript. We are thankful to Dr. Charles Kato Drago for his tireless review of this systematic review paper. Supplementary data is submitted with this manuscript in form of Tables. The authors declare that there was no funding agency which extended financial assistance towards this Systematic review. 13104_2018_3738_MOESM1_ESM.docx Additional file 1. One way ANOVA results. Table S1. Mean percentage of sample wise distribution of carbapenem resistant isolates generated by One-Way ANOVA. Table S2. Average percentage prevalence of the different carbapenem resistant bacteria computed by One-Way ANOVA. 13104_2018_3738_MOESM2_ESM.doc Additional file 2. Class A, Class B and Class D genetic determinants of Carbapenem resistance. a. Table S3. Showing Ambler class A carbapenemase, their variants, organisms harbouring them and location. b. Table S4. MBLs, their variants, organisms harbouring them and location. c. Table S5. Carbapenem-hydrolyzing class D β-lactamases (CHDL), organisms harbouring them, their geographic distribution and location. d. Table S6. Shows the prevalence of carbapenem resistance in K. pneumonia in all WHO regions. e. Carbapenem resistance Knowledge gap in East Africa (S-CRKGEA). World Health Organization. Global priority list of antibiotic-resistant bacteria to guide research, discovery, and development of new antibiotics; 2017. http://www.who.int/medicines/publications/global-priority-list-antibiotic-resistant-bacteria/en/. Accessed 16 June 2017.